Jewels 2009 the annual exhibition organized by the Gemologists Association of Sri Lanka (GASL) was held on the 12th and 13th of December 2009. The venue of the exhibition was the BMICH Committee Lounge. The GASL is said to be the only professional organization in the gem trade. 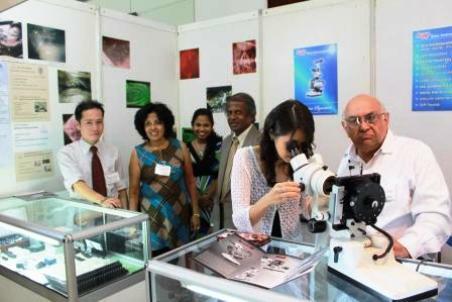 The aim of the exhibition is to educate the general public on different aspects of gems and gemology. Just like previous years this year too there were competitions to select the best gemological photograph, best cut gemstone, gem studded jewelry said Ruzwan Kamil, Chairman Jewels 2009. The National Gem and Jewellery Authority (NGJA) was the principal sponsor of the event . All visitors to the Jewels 2009 were given a natural gemstone, with the purchase of the entrance ticket. On display were rare gemstones, jewelry and minerals. There were also demonstration of the traditional gem cutting and modern gem cutting methods as well as demonstration of heat treatment.